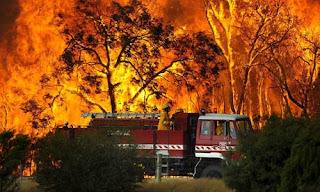 Southern Australia is facing deadly bush fires, the worst in the country's history. The death toll has reached 108 as entire towns in Victoria state are destroyed by temperature and winds which cause the fires to rise. BBC news website reports that witnesses have described seeing "walls of flames four storeys high, trees exploding and the skies raining ash, as fires tore across 30,000 hectares (115 square miles) of forest, farmland and towns. Australian police have said that the arsonists responsible for lighting the fires could be charged with murder.